I found this recipe recently when I was at my daughter’s orthodontist appointment. The secretary in the office is so nice, whenever I find a recipe in a magazine she always offers to photocopy it for me. 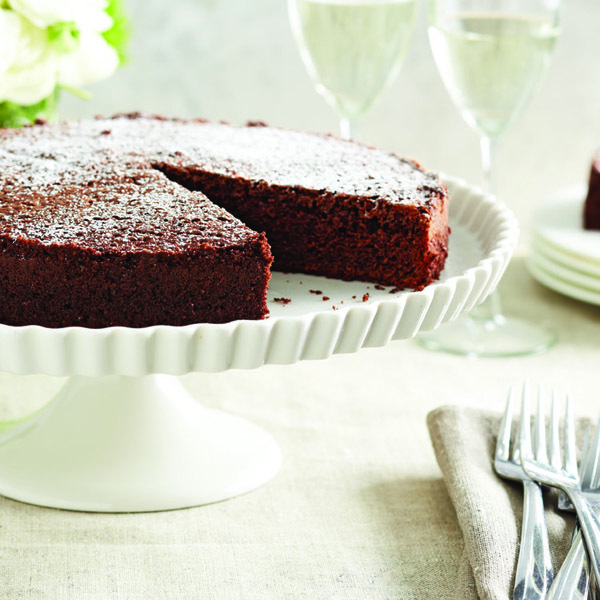 It’s a chocolate cake using olive oil instead of canola oil. I decided to give it a try since I was told it turns out very moist with olive oil. I made it this weekend and it turned out yummy. The only thing I would consider changing is substituting an egg for 1/4 cup applesauce, 1/2 mashed banana or 1 tbsp of ground flaxseeds with 3 tbsp of water for a healthier option. Preheat oven to 325F. Lightly coat a 9-in. pan with olive oil and line the bottom with parchment paper. Pour boiling water over cocoa powder and whisk to combine. Whisk in vanilla. Combine sugar with eggs and olive oil in the bowl of a stand mixer. Beat on high until mixture is fluffy and pale yellow. Add cocoa mixture and beat until smooth. Gradually add flour mixture and beat until combined. Pour batter into prepared pan. Bake for about 50 min. Let cool in pan for 15 min, then peel off parchment paper before serving.